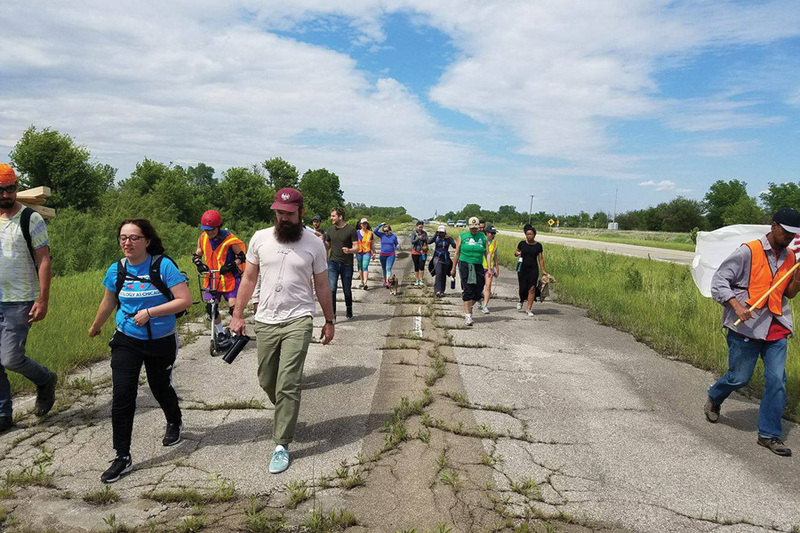 Activists march to Springfield from Chicago. The group is advocating for a progressive budget plan and to raise awareness about the ongoing stalemate. The schedule is strict and consistent. Every morning since leaving Chicago on May 15, Joe Padilla and Anna Sekiguchi have woken up, swallowed down breakfast and started marching toward Springfield by 9 a.m.
Alongside 10 other activists from Fair Economy Illinois — a coalition of groups who organized the march — the college students have walked until 5 p.m., averaging 13 miles per day and sustaining themselves on three breaks: 15 minutes in the morning, an hour for lunch and another 15 minutes in the afternoon. Padilla, 21, said the group’s goal is to reach Springfield’s new capitol building by May 30 — before the end of the Illinois General Assembly’s spring session — to draw attention to the two-year budget stalemate. The state has gone without a budget since July 2015, which has forced cuts to many social services and downgraded the state’s credit score. Last December, however, the idea gained traction as activists grew tired of the lack of cooperation among legislators, Padilla said. By February, FEI leaders began putting together task forces, saving money and lobbying others to support a roughly 200-mile trek from Chicago’s Thompson Center to Springfield. Aside from The People’s Lobby and four other FEI member organizations, there are 13 groups either co-sponsoring or supporting the march, according to the March to Springfield’s website. Sekiguchi, 18, also a member of The People’s Lobby, said numerous churches and community centers have been donating meals and providing the marchers with places to sleep along the journey. Though there are only a dozen people walking the entire route, Sekiguchi said others have joined as day marchers or short-term volunteers. The activists end their days by holding listening events at each stop along their path in an effort to hear from local communities about how the budget impasse has affected their lives. Padilla and Sekiguchi — students at University of Illinois at Chicago and University of Illinois at Urbana-Champaign — said they connected with people on the underfunding of schools and of resources for women, mental health and the LGBTQ community. As the group marches toward the capitol, legislators remain locked in a battle to pass a budget so the state won’t go unfunded for a third year. Illinois Senate Democrats on Tuesday passed a budget that would raise the income tax and expand the sales tax to stabilize the state’s finances. The tax legislation would bring in roughly $5.4 billion in new revenue. In a statement Tuesday, Republican Gov. Bruce Rauner said he would not sign off on a budget agreement that increases taxes without real property tax relief because the state’s property taxes are the highest in the country. “The biggest issue that now stands in the way of us reaching an agreement is resistance to freezing your property taxes, and giving you the ability to control whether your property taxes go up or down in the future,” Rauner said in the statement. The FEI budget plan calls for an additional $23 billion in revenue by closing corporate tax loopholes, implementing a progressive income tax and passing a small sales tax on LaSalle Street transactions. The money generated would allow the state to fully fund universal health care, provide tuition-free education in community colleges and public universities and better invest in social services and the environment, according to FEI’s website.